We would like to point out that the ranking within the local authority, which our school achieved in the 2013 SATs results, was 41st and NOT 94th as was published in error in the EADT on Friday December 13th, for which they have apologised. For further information on our results click on the Department for Education link below, or at the bottom of our webpage. We have been made aware that some local advertising has indicated the wrong start time for the Christmas Eve Nativity play, taking place at St Michael’s Church. We have been asked by the Holy Horrors team to let parents know that the Nativity on 24 December will start at 3.30pm. The Church fills up very quickly for this service, so please do allow enough time to get a seat. Don’t forget to return your raffle ticket stubs (clearly written with your child’s name & class) and money before 9am on Wednesday. The draws will take place during Wednesday. The school council aim to raise money for victims of the typhoon in the Philippines (through Christian Aid) with a non-uniform day this Wednesday. Please remember clothes and footwear must be suitable for a day at school. Please donate whatever amount you wish. Our Carol Service will take place at St Michael’s Church this Thursday. Children in classes PLDD, RV & KV will be leading in this service. Parents of these classes are warmly invited to attend. We would ask that you use the seats at either side of the church or at the back. A charity collection will be made at the end of the service in aid of the Philippines Appeal. The only clubs on this week are Art, Holy Horrors (at the Church) & Gym. There are lots of items in our lost property container. Can we please encourage all children and parents to seek for lost items in the container sited at the end of the corridor at the top of the stairs above the Nursery. ANY ITEMS NOT CLAIMED BY FRIDAY 20 DECEMBER WILL BE GIVEN TO CHARITY IN THE NEW YEAR. We would like to thank everyone who gave so generously to the charity collections at the end of the Foundation & KS1 Celebrations; the collections have raised £770 which will go to the Philippines Appeal through Christian Aid. Thanks also to Florrie, Ella and Lily in year 6 who have raised £72 for this appeal too - well done girls! The Friends would like to thank the children and families of classes EM & NS who baked for their Christmas cake stall last week, it raised £113, thank you too to all those bought too. We would like to inform parents that from January on Wednesdays Mrs Skevington will be taking the class. DON’T FORGET TO COME IN YOUR PARTY CLOTHES ON FRIDAY! Please remember clothes and footwear must be suitable for a day at school & outside. DEADLINE FOR HALF-TERM PAYMENT IS MONDAY 13 JANUARY. For good self- care, keep your medicine cabinet well-stocked with the items you and your family need. For minor illnesses, advice on medications and colds, coughs, minor burns, strains and sprains - or if you need emergency repeat prescriptions - contact a pharmacist. Your surgery is great for advice on health problems, and examinations and treatments. All main surgeries are open between 8am and 6.30pm Monday to Friday. On the day appointments are available if your need is urgent. If you need help when your surgery is closed call 111. You will be asked for information to direct you to the correct service, or to arrange for an ambulance where appropriate. Ipswich Hospital and West Suffolk Hospital have Emergency Departments for emergencies only. Call 999, only for life-threatening illnesses or injuries. Drama classes continue at St. Michael's Rooms from 4pm - 5pm every Thursday starting Jan 9th. Free taster sessions available for new-comers. A new class for 10 years and over will be starting soon on Tuesday evenings at Thomas Mills. For details contact captivatedramafram@gmail.com or call/text Ali 07867807144. There is a FOOD DONATION bank bin just inside St Michael’s church on the left, it's a purple plastic bin, these food donations are taken to the Salvation Army in Woodbridge to distribute. If you would like to find out more about this call Victoria in the Parish office on 01728 621255. MFSF Wind & Brass, French and Tennis (letter to follow) & all lunchtime clubs. to school on TUESDAY 7 JANUARY 2014. Did you pay for Christmas lunch today? IF NOT, PLEASE PAY TOMORROW. The cost for the day £3.20, or £1.00 more is required if you have paid for the whole term but not for the Christmas lunch yet. DON'T FORGET TO HAND IN YOUR RAFFLE TICKET STUBS AND MONEY BY THE END OF TOMORROW. MORE TICKETS ARE AVAILABLE AT THE OFFICE. Take a look at the fabulous hampers you could win below! SRH Football team after winning the trophy and medals. There were 24 teams taking part. Our team won all of the group games to get into the semi finals. The semi final was a frustrating 0-0 draw despite Fram having most of the chances. The game was decided by penalty kicks. Each team took 4 kicks with Fram winning 3-2 thanks to 2 saves by Zac and 3 good goals by George, Harrison and Ethan . We also entered a B Team into the tournament. They also won a very strong group and progressed to the semi finals. They only lost 1-0 in the last few seconds to Stonham Aspal. The B team(coached by Mr Cantrell and Mr Skeggs) played some excellent football with special mention for the 2 year 5 boys: Oli and Charlie and our girl Amelia - who showed her excellent skills and running ability throughout the tournament. The final between Fram and Stonham was a high class game. Despite having most of the early chances Fram were caught on the break by a very quick Stonham forward. Fram batled very hard to get back into the game. With just 5 minutes to go Ethan scored a well deserved equaliser. The match had a dramatic finish. With Stonham on the attack Dylan made a tackle and a superb pass to Ethan who sprinted clear to score the winning goal with less than a minute to go. The cost for the week is £12.00, the day £3.20, or an additional £1.00 is required if you have paid for the half term but not for the Christmas lunch yet. Remember to bring some pocket money in on Friday 13 December to buy a yummy Christmas treat. The school council have recently discussed the disaster in the Philippines and wanted to raise some money in support of the victims of the typhoon. They have suggested a non-uniform day on Christmas Dinner Day – Wednesday 18 December where any money raised will be paid to the appeal through Christian Aid. Please donate whatever amount you wish. There will be NO Tennis, French, Football, Reading or Orchestra in the last week of term. There are NO MFSF music lessons with Biddy in the last week. Art, Holy Horrors (at the Church) & Gym WILL run in the last week. There will be NO lunchtime clubs in the last week of term. Reading, Rugby, Hockey, Orchestra, Art, Holy Horrors & all lunchtime clubs. will be MFSF Wind & Brass, French and Tennis – tennis letter to follow. Due to time constraints with assemblies until Christmas, we are afraid we will not be able to hand out any certificates other than the ‘Star of the Week’, until the New Year. On Thursday the kitchen will be serving Wednesday’s menu (Meatballs) instead of a roast. Don’t forget to return your raffle ticket stubs (clearly written with your child’s name & class) and money in an envelope marked with the class name (so you are put in the draw for the right hamper) by Tuesday 17 December. If you sell tickets to friends & relatives, you will still need to add your child’s name & class so that the winning hamper will go via the correct family. Thank you. If you have raffle tickets that you are unable to sell, please return these to the school office as soon as possible in case we have requests for more books. Members of the school Eco-Council in St. Michael's Church, Framlingham. The Eco-Council went to the church with members of the Greener Fram group to decorate a tree for the Christmas Festival. The children had made the Angel decorations using old copies of the Framfare and Greener Fram magazines. They also used old CDs for other decorations. A lovely time was had by all! Due to a missed week of swimming earlier this term (when the College were on half term) we would like to remind EM & NS that they should remember to bring in their swim kit tomorrow – Wednesday 4 December. Our Carol Service will take place at St Michael’s Church on 19 December. Children in classes PLDD, RV & KV will be leading in this service. Parents of these classes are warmly invited to attend. We would ask that you use the seats at either side of the church or at the back. A charity collection will be made at the end of the service in aid of the Philippines Appeal. Due to the children having class Christmas parties on Friday 20 December; it has been decided to move the usual end of term cake stall a week earlier. Remember to bring some pocket money in on Friday 13 December to buy a yummy Christmas treat. Cake boxes & letters will be sent to classes EM & NS shortly. Classes KM CA LC & JC performance of ‘It’s A Baby!’ next week is “SOLD OUT” FOR THE WEDNESDAY – if you have any unwanted tickets for this day please return them to the office. Thank you. Well done to the singing club for their lovely performance at St Michael’s Church Advent Service on Sunday. It was great to see their families there to support them and to join the service. The Reception classes will be open on Thursday 9 January from 9.15-11.00am for parents with children due to start school September 2014 (Born between 1/9/2009 – 31/8/2010). 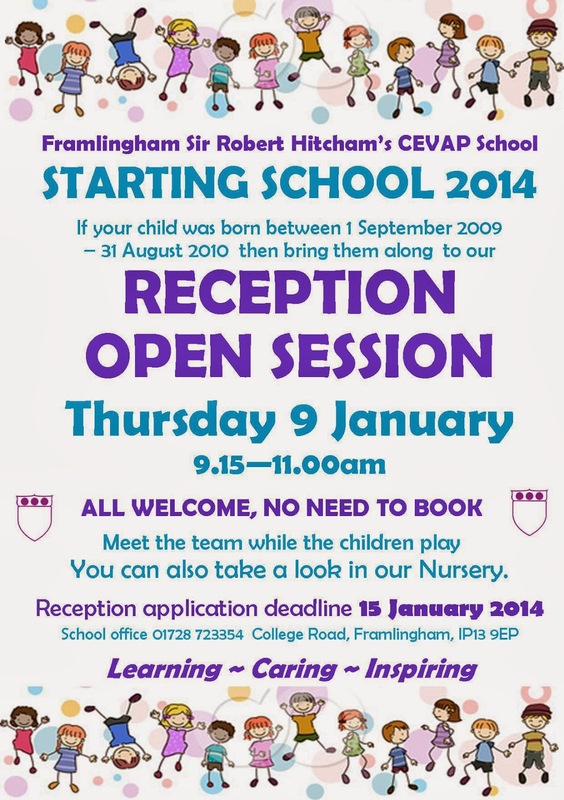 Reception Applications for next year MUST be returned to the Admissions Team at Ipswich by 15 January 2014. For information go to: www.suffolk.gov.uk/admissionstoschools, you can apply online at www.suffolk.gov.uk/onlineadmissions. You will need to complete a SIF form (Supplementary Information Form) to return to the school office.